Medicaid Block Grants Are Part Of Plan To Redo Obamacare : Shots - Health News Trump adviser Kellyanne Conway says Medicaid block grants are part of the new administration's plan to replace the Affordable Care Act. Kellyanne Conway, now an adviser to President Donald Trump and seen here at a November campaign rally, said on NBC News that the Trump administration plans to move Medicaid financing to block grants administered by states. Medicaid is now funded by the federal government and states together and it has an open-ended funding stream, meaning it pays for all health costs to which its beneficiaries are entitled under the law. Conservatives who are concerned about the impact the growth in health care spending will have on the federal and state budgets have advocated block grants as a way to cut the Medicaid costs. But many health policy analysts say that block grants could lead to reductions in care. "A Medicaid block grant program would institute deep cuts to federal funding ... and threaten benefits for tens of millions of low-income families," said Edwin Park, vice president for Health Policy at the Center for Budget and Policy Priorities, in a report on the group's website. Block grants can take several forms. Under one scenario, the federal government would offer a fixed sum of money to each state, which would grow with inflation. Since the rate of overall inflation is typically lower than inflation in the health care sector that leads to an erosion of spending over time. And such a fixed block grant means less money is available when the economy is suffering and more people qualify for Medicaid benefits. Another scenario offers states an allowance for each beneficiary. Under such a plan, spending would increase in bad economic times to cover the additional people who need care. However, overall benefits could still fall over time, depending on how the program accounts for rising health care costs. Conway didn't give details about how a block grant program would be structured. Medicaid grew under former President Barack Obama, who gave states the option of expanding eligibility for the program to millions of people who live above the poverty line. Thirty-one states and the District of Columbia have expanded their programs. Republicans who are advocating repeal of the Affordable Care Act haven't said whether they will force those states to roll back their Medicaid programs. Conway also reiterated Trump's promise that "everybody" will have insurance coverage under his Obamacare alternative. "President Trump has said that people will not go without coverage. And he means that," she said. "That is certainly part of the official plans that are being worked on." However, she said that health care for all didn't mean the president advocates universal coverage or a single-payer health plan. "What he means is that no one will go without coverage," Conway said. "There will be ways for people to access affordable, quality health insurance if they'd like to get it." 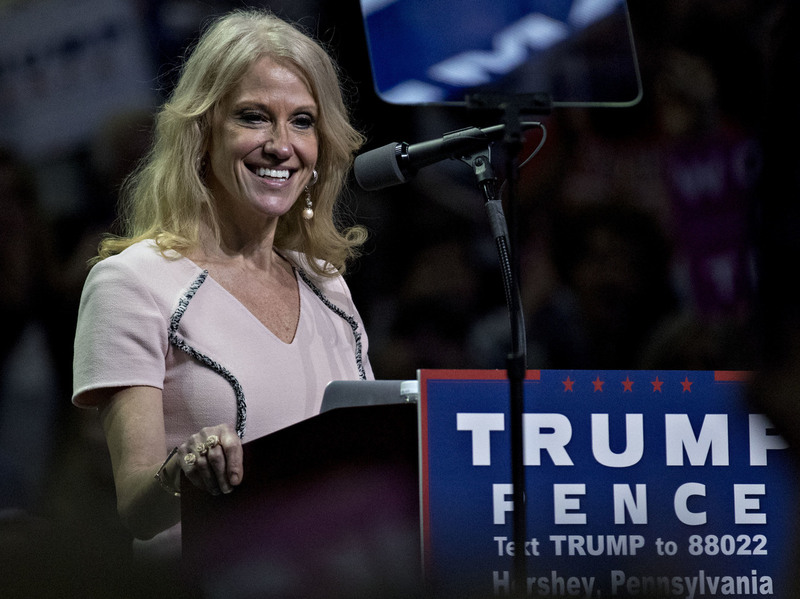 Conway said voters can also expect an Obamacare replacement to include wider use of health savings accounts, which allow people to save money tax-free to help pay for their medical costs. Critics say such accounts don't help low-income people who struggle to pay health insurance premiums because many don't have extra money to put aside. Also, they often pay little or no income tax, so such an account doesn't give them a boost. Health savings accounts, depending on how they're structured, can help wealthy people however. That's because they allow people with high incomes and who pay a high rate of high tax to shelter more of their money from federal taxes.